The extreme cold and high pressure seem to have made the fishing very challenging on Hebgen lately. At least we have had hardly had a breath of wind, so the cold hasn’t been too bad. 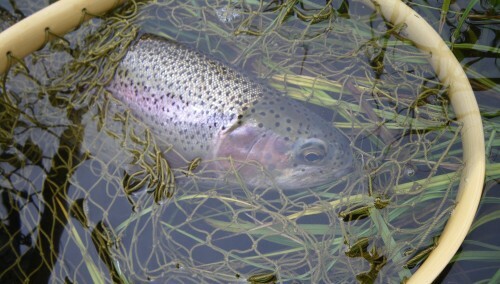 And, the hearty and patient are catching REALLY nice trout. They seem to be catching these days along the shores about 20 yards out in about 10-20 feet of water. The fish are above the weeds, so they are catching about 3 feet above the bottom. We’ve heard of them using everything! Mealworms are the favorite, but they are still using nightcrawlers and maggots. The dam area is now open to ice fishing, although the dam construction project still has “Keep Out” signs and gate up. It is ok to walk down and get out on the ice, as long as you don’t get too close to the dam where the construction project had open water up until a week ago. Or, you can snowmobile down there from the Kirkwood Marina. We haven’t seen as many guys out there as usual…maybe this weekend they will be back. It is a real favorite for many of the hardwater guys on Hebgen. The Narrows always has a few fishermen out there…they catch consistently there. For information on the West Yellowstone Ice Fishing Tournament (February 1-3), click HERE.